Full-length action from American Idol's Southern Man. 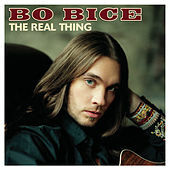 Fans will remember his Tom-Jones-meets-Ronnie-Van-Zandt take on "Vehicle," but for everyone else -- the guy's name is Bo and he sings big ballads like he has no shirt on. The LP opens a bit straight, with Clay Aiken-ish pop. By song two, Bice is drawling like he should and following in the steps of Sheryl Crow.